Tailoring and alterations: We consider our clothing alterations team to be the best in Effingham County, and if you come in, you’ll see why. We combine a friendly attitude with a keen eye for detail and an efficient process that ensures your garment will fit you like a glove in a timely fashion. Whether it’s a prom dress or just a pair of trousers, if it needs altering, bring it to Alterations by Ruth. Wedding dress alterations: One of our specialties is wedding dress alterations. Our tailors are invested in making your special day as picture perfect as possible, and we will work with you to make your wedding dress reflect your own individual vision. Because we’re a locally owned business and not a huge chain, we can take the time to put special care into each wedding dress we alter, and we hope one of those dresses will be yours. 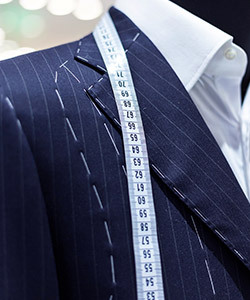 Suit alterations: We also offer Effingham County’s most precise suit alterations. If you have a special occasion coming up and want to look sharp, leave it to us to have your suit fitting perfectly in no time. Sewing shop: In addition to tailoring and alterations, we also sell a wide range of tailoring and sewing products. If you want to take your clothing into your own hands, rest assured that we will provide you with the finest products available. For the best in tailoring and alterations, call Alterations by Ruth at 912-826-7407 and find out why our customers choose us for all their alteration needs.